The spread of fall armyworms in corn fields across the country has prompted authorities to seek measures to minimise economic damage to the agricultural sector. [Daily News] THE fight against fall armyworms within the East African Community (EAC) has received a major boost following financial aid from the European Commission Directorate for International.. There is panic among some farmers in the Ashanti Region as the devastating Fall Armyworms re-emerge in some farming communities. [Nyasa Times] Maize production for 2017/2018 growing season will reduce by over 283,941 metric tonnes due to prolonged dry spells including fall armyworms that have 18 districts and estimates that 1.9..
Prices of major staples like maize are likely to shoot up following the destruction caused by the invasion of fall armyworms. Agricultural industry stakeholders are pushing for the application of fresh innovations to help deal with Fall Armyworms which have invaded farms across the continent. From an initial figure of 1,400 hectares of affected farmlands as at May this year, more than 112,000 hectares of farm fields have been invaded by the Fall Armyworm pests. A pesticide scientist is warning of a massive resurgence of the fall armyworm unless the Food and Agriculture Ministry finds a sustainable remedy. Agriculture Minister, Dr Akoto Owusu Afriyie has been asked to concentrate on fighting the fall armyworms rather than praising government's interventions since the start of invasion. The Agric Minister says government deserves commendation and not condemnation for how it has managed the fall Armyworms in farms across the country. Deputy Agriculture Minister, William Quaitoo says dangerous pest, fall armyworms have not been defeated as claimed by his boss. The Ministry of Food and Agriculture (MOFA) is claiming victory in the ongoing fight against the invasion of Fall Armyworms in the country. A new hungry caterpillar is devastating African crops already badly hit by record droughts, spreading to more than 20 countries. The Food and Agriculture Minister has denied reports in the media that the Ministry had blown a whopping ¢20 million on chemicals in dealing with the recent Fall armyworms invasion. 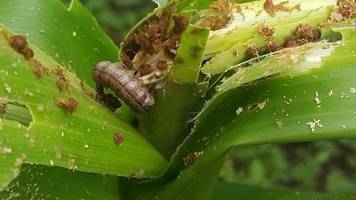 The Peasant Farmers Association of Ghana has implored government to intensify education on fall armyworms as a way of combating the pests which invaded some farms in the country. [VOA] A recently arrived species of armyworm has spread to 21 African countries and threatens the continent's main food staple, maize, report experts from the U.S. Agency for International Development. Mike McClintock, Boone County extension agent-agriculture said the Fall armyworm is in our area. The Minority in Parliament has registered its disappointment with the Agric Minister who failed to appear before the House to answer questions on the threat Fall armyworms are posing to farms across.. The Agriculture Minister has assured that although about 20,000 hectares of farm yields have been affected by fall armyworms invasion the infestation is under control. After more than a year of wreaking havoc across western and southern Africa, fall armyworms have now been reported in most countries in eastern Africa, including Kenya, Tanzania, Uganda, Rwanda,..
Pests known as fall armyworms are destroying crops in southern Africa and have spread north to affect 20 countries. The fall armyworm is an invasive species that is native to North and South America,..